I have everything I should have told you in the shoebox by the bathroom door; Ice blue can’t be repeated; I have a handbag filled with I don’t know ya’s; Rain let it pour, wash us all away, If you promise me, I won’t drown in your dust; Last night I dreamt I had my shadow like a baby; The need I have for you to touch me; the corners of the room suspect you’re hiding something; Your room, my room, left and right chambers of the heart; Break me, Break me, Broken me, where’s the ocean when you need it; This year, its been a hard year, I couldn’t get around it. This year, its been a hard year, I couldn’t get over it. This year, its been a hard year, I couldn’t get through it. One particular song that stood out among many deeply lovely tunes, was a jazzy croon through a lovely sultry mood while Sparke sang “Gone now; Gone thou; Years and years and years and years of love.” It was easily one of the most beautiful things I have ever heard. 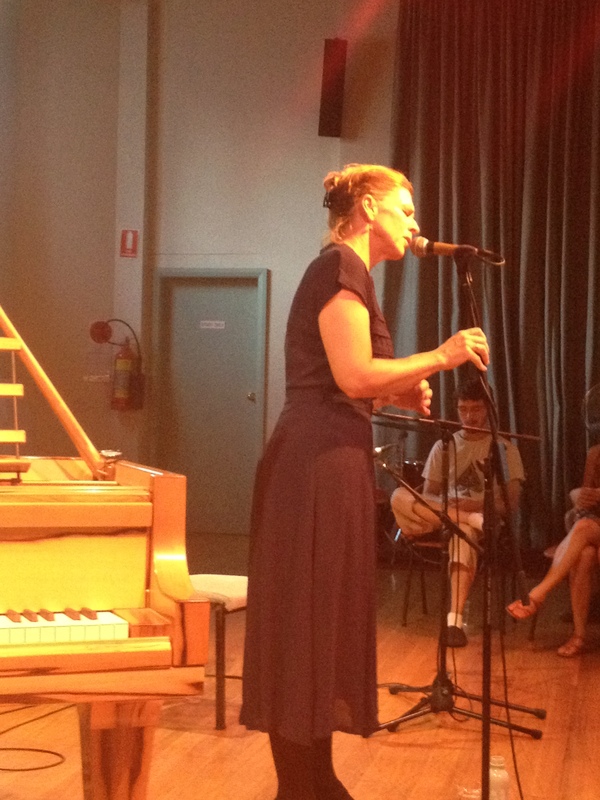 Tanya Sparke loses herself in the song and takes us with her as she goes. These are dark songs filled with poignancy and meaning she has a strong voice that she manages to keep at the very edges of soft. When pain sounds this good who needs pleasure? One interesting point, She picked up a guitar at one stage, and said she sings differently when she sings to her guitar, and it was immediately evident. She sounded much more like Judy Collins at the guitar, and no matter how lovely that is, I was pleased when she went back to the piano. Even though I love Judy Collins, I didn’t detect a trace of influence in the earlier works, and it doesn’t do Sparke any justice to make the connection. She’s better when she is free to focus and when we get 100% completely her through her beautiful songs. If you ever get any chance to hear this woman, be it concert or recording, grab it with both hands. 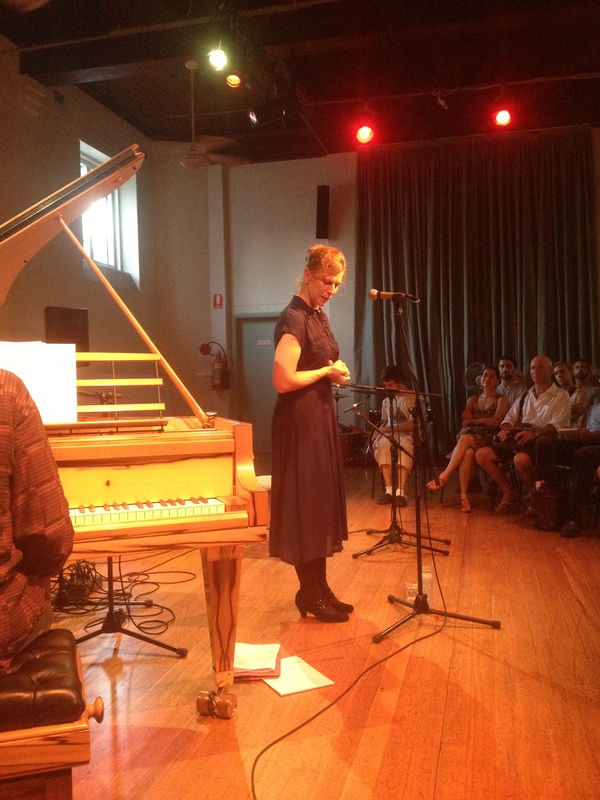 The other concert I heard on this day at the Festival was Prophets, a stunning little outfit consisting of Laura Altman, Peter Farrar, Dale Gorfinkel, Sam Dobson, Lochie Bradfield, Finn Ryan (who I saw a couple of weeks ago at the Now Now) and James Waples. Prophets – Ah!Puch!, Bird Brain, Groovy G, Heaps Mad, Shazzam, Ctrl+Alt+Man & Pug – are the of originators of the Stylefree Movement. 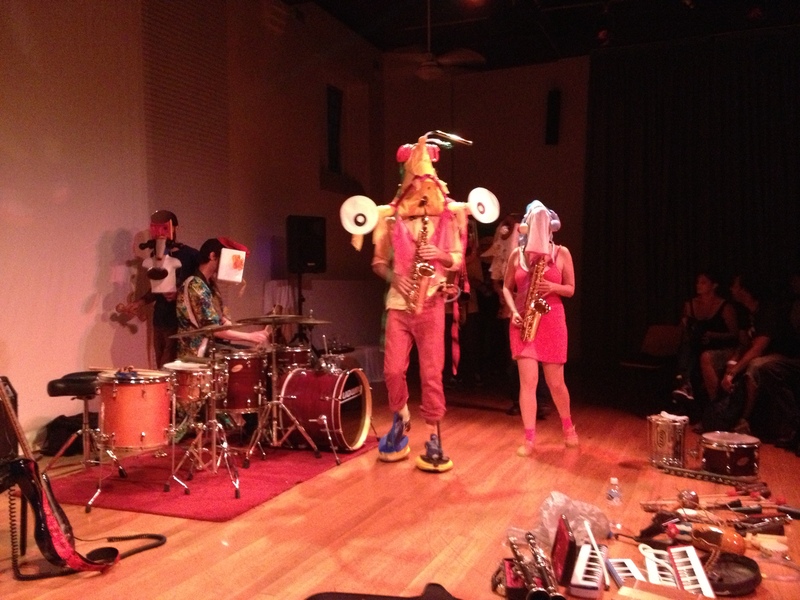 The best dressed and grooviest street band in Sydney & Melbourne, Australia!!! 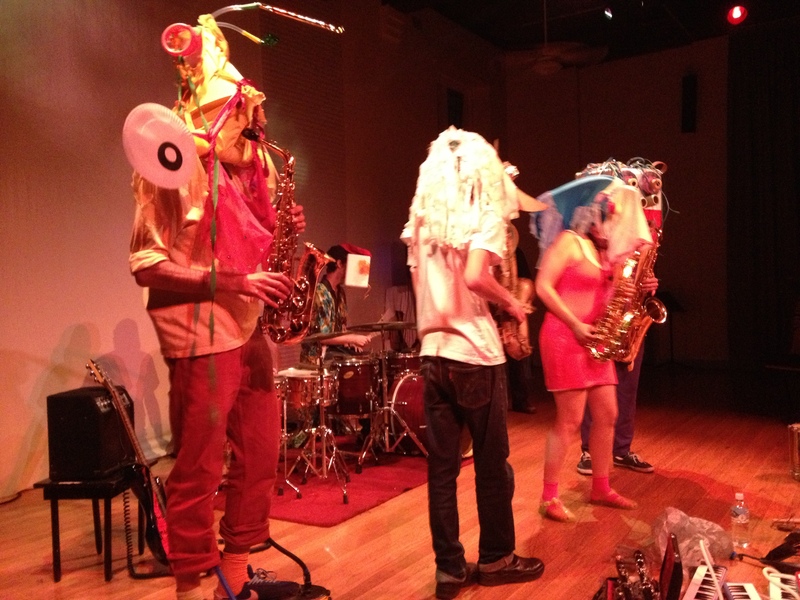 Playing raw grooves with multiple saxes, drums, percussion, balafons, melodicas, guitars, xylophones, MPCs, basses, masks and wonderment! So here we have a group of some of the best jazz musicians in Sydney Jamming together in what only can be described as – Jam. This is free flow music at its most basic elemental core. Of course, you can’t hide the talent in the group, but part of the bands aesthetic is that they believe everyone can play music – and that everyone Should! 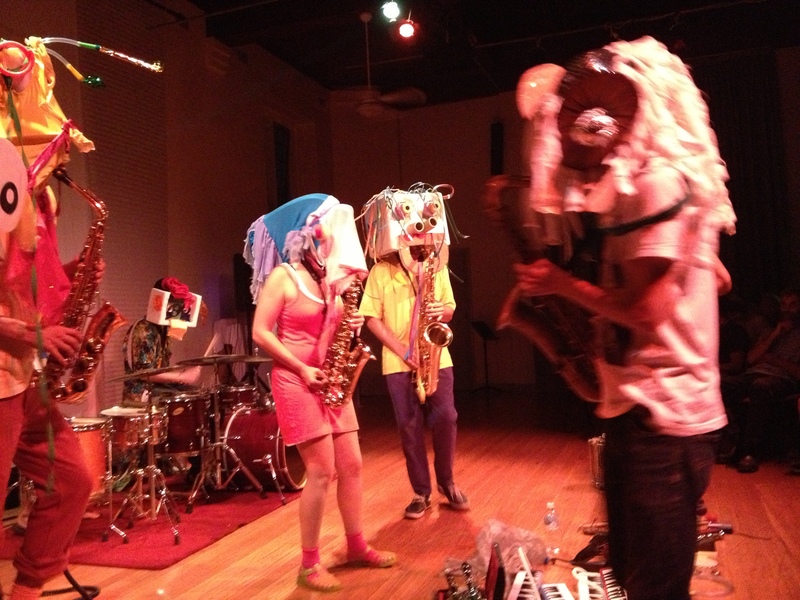 They hire them selves out at parties, only appear in crazy masks, and play some of the best jazz you will hear all year. Their emphasis is on polymorphic sax improv, so there are some stunning sounds coming through from the four strong horn section. 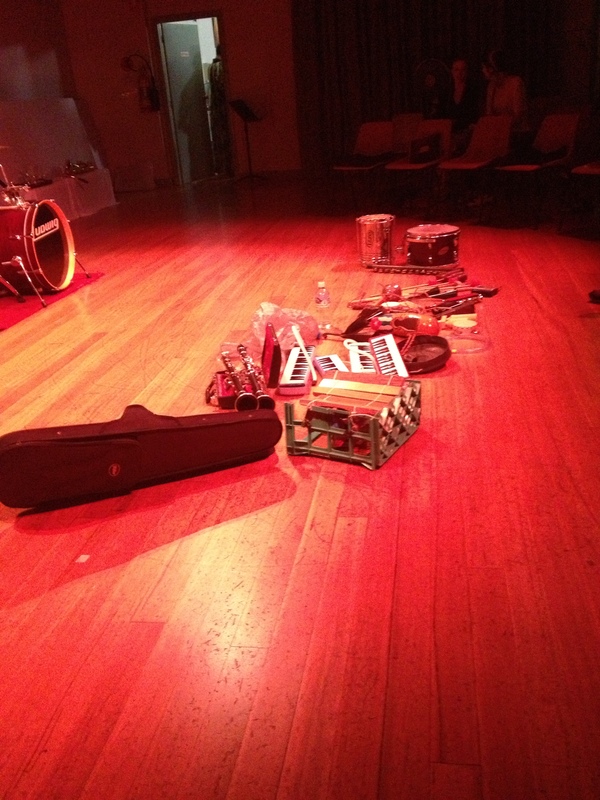 They will often put the horns down, however and pick up melodicas, mini tambourines, maracas, bells, cowbells, whistles and pretty much anything that you can bang or clang together to make a sound. There was even an electic guitar sound that came to the fore at one point. Its a wonderful way to enjoy music, with all the visual splendor and the meandering dancing sax with the noise noise noise of all that is dragged into the room with them. I noticed on their website that they like to perform for kids, and I can only recommend you grab the kids if you are lucky enough to get a chance to see them. If you can’t take kids – get to see them anyway.